Julien’s Auctions, the world-record breaking auction house, has announced that MUSIC ICONS: THE BEATLES IN LIVERPOOL, their annual auction extravaganza of the Fab Four’s most iconic and historic memorabilia, will take place at The Beatles Story on Thursday, May 9. It will be the first Beatles auction to take place at The Beatles Story, as the world’s largest permanent exhibition dedicated to the Fab Four the award-winning attraction will act as the perfect back drop for the event. Fans and collectors will be able to track the auction live at juliensauctions.com. In addition, Julien’s Auctions will partner once again with The Beatles Story to bring their Beatles and Merseybeat ‘Memorabilia Day’ to the attraction on Friday, May 10. Fans and collectors are invited to bring in their Beatles memorabilia to have it appraised for free by the experts. 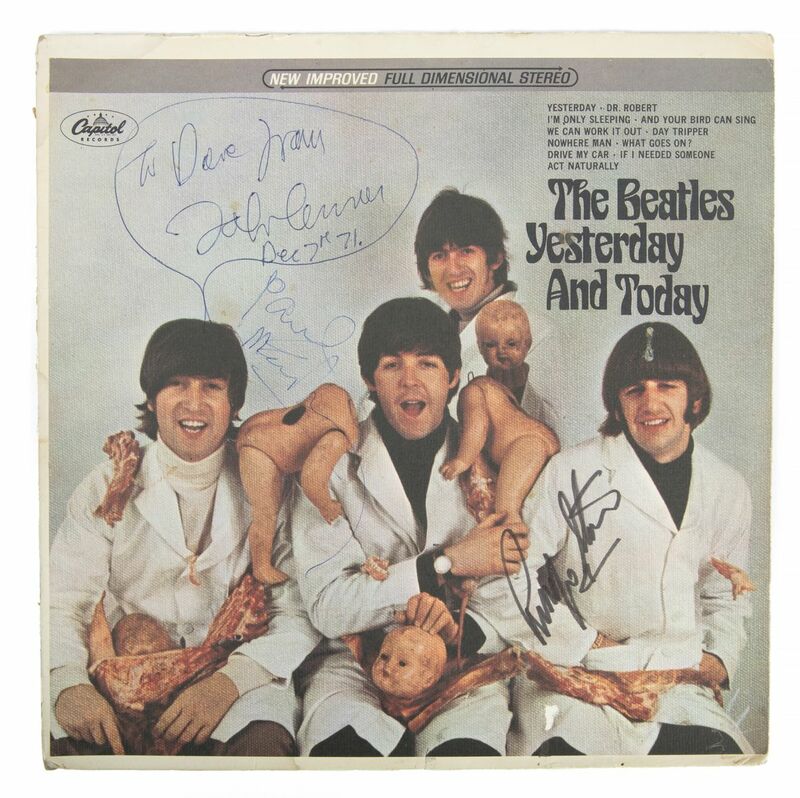 One of the highly anticipated items in this years’ auction is John Lennon’s owned and signed album “Yesterday And Today” (1966), a U.S. First State Butcher album prototype stereo example considered by Beatles experts as the rarest Beatles record in the world. It was displayed on the wall of his Dakota apartment in New York until he had an assistant take it down and deliver it to the Record Plant where he signed it in blue ink: "To Dave from/ John Lennon/ Dec 7th 71." The recipient was Dave Morrell, a Beatles fan and bootleg collector. “The Butcher” was given in essentially a trade for a reel-to-reel tape of Morrell’s Yellow Matter Custard bootleg that Lennon desired. Lennon filled the blank back of the cover with an original piece of art depicting a man holding a shovel with his dog in front of a setting sun. The cover also includes autographs by Ringo Starr and Paul McCartney, which Morrell obtained later. This is believed to be the only First State Butcher album bearing three Beatles signatures and is estimated at $160,000- $180,000. "There is no Beatles album in the world that compares with this one in terms of both rarity and value," said Gary Hein, Beatles expert. "This important world class pop culture piece would add significantly to any Beatles collector, Art, Pop Culture or Record collector’s collection." Another Lennon piece coming to auction for the first time is his owned and signed guitar strap (estimate: $20,000-$30,000) for his 1956 Les Paul Junior guitar used at the One to One sessions at Butterfly Studios in New York and on stage during the time that the Plastic Ono Elephant's Memory band backed Lennon and Yoko Ono (1971-1973). 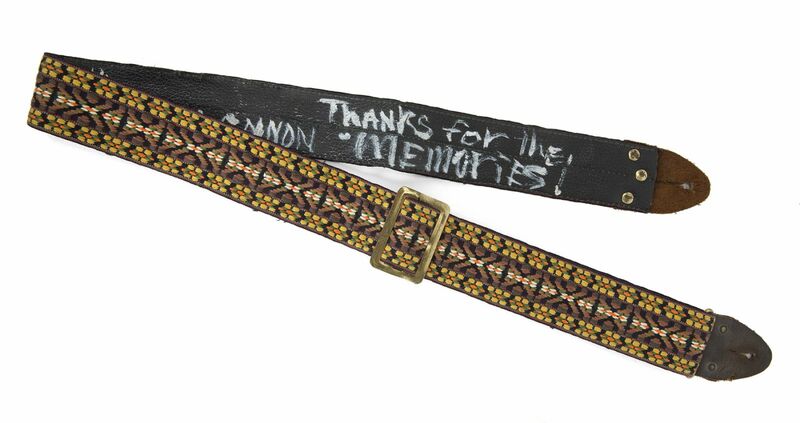 It is the only guitar strap signed by Lennon to come to auction. Other fascinating, personal items associated with John Lennon include a signed publishing agreement for the song “Julia” estimated at $8,000-$10,000; his drawing “Astro Gems” featuring his version of Stonehenge from his language art class in 1976-77 (estimate: $20,000-$30,000); Lennon's detention records from his teachers at Quarry Bank High School (estimate: $3,000-$5,000) and more. 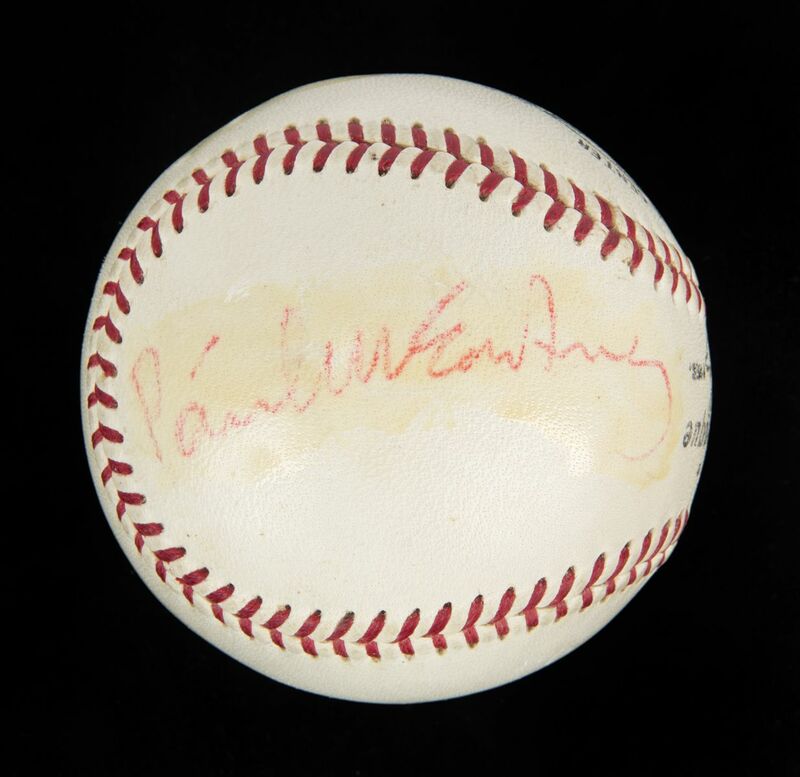 Beatles items up for bid include a baseball signed by the Beatles and given to Mike Murphy, manager of the San Francisco Giants Clubhouse during The Beatles’ final U.S. concert at San Francisco's Candlestick Park on August 29, 1966 (estimate: $80,000-$100,000); a Liverpool Airport poster signed by the Fab Four (estimate: $30,000-$50,000) which announces the "Visit of The Beatles" on July 10, 1964; a 1962 Beatles signed school book tablet made into an autograph book featuring the early Beatles (estimate: $10,000-$20,000); and a The Morecambe and Wise Show (Associated Television Ltd) script signed by The Beatles (estimate: $15,000-$20,000) for their television show appearance that aired on December 2, 1963. Also up for grabs is a Beatles audition tape made on January 1, 1962, for a contract with Decca Records, featuring seven songs from the infamous recording session where the band were subsequently rejected by Decca and reportedly proclaimed, “The Beatles have no future in show business” (estimate $10,000-$20,000); a black and white promotional photograph signed by George Harrison, John Lennon, Paul McCartney, and Ringo Starr taken by Les Chadwick, assistant to photographer Peter Kaye in Kaye’s Liverpool photographic studios in September 1962 (estimate $8,000-$10,000); George Harrison’s original handwritten lyrics and documents letters from the early 1970s, including a handwritten first draft of his 1971 song "Bangla Desh," written to raise awareness for refugees in East Pakistan, when Harrison started to organize “The Concert for Bangladesh" with Ravi Shankar and handwritten letters from Klaus Voormann, who designed The Beatles' 1966 “Revolver” album cover (estimate: $60,000-$80,000). Amongst many other fascinating and iconic Beatles items fans can also get their hands on a felt pen drawing of a city in the valley, with two large eyes in the sky, drawn by Harrison and Geoffrey Baker while in Rishikesh, India in February 1968 (estimate: $8,000-$10,000); a student information card for Paul McCartney and a ledger with information about McCartney, George Harrison, and many others, from 1959 to 1979, both from The Liverpool Institute (estimate: $15,000-$20,000); a left-handed Hofner B-Bass Hi-Series guitar signed on the mother-of-pearl pickguard in blue marker by Paul McCartney (estimate: $4,000-$6,000); and an original 1960s internal wood door from Tittenhurst Park, Berkshire where John Lennon and Yoko Ono lived from 1969 to 1971, and Ringo Starr owned from 1971 to 1989. The home was the centre for most of Ono’s and Lennon’s recording, film, political, and promotional activities until they left for the United States, including the recording of their "Imagine" album and the filming of the correlating movie (estimate: $2,000-$4,000). 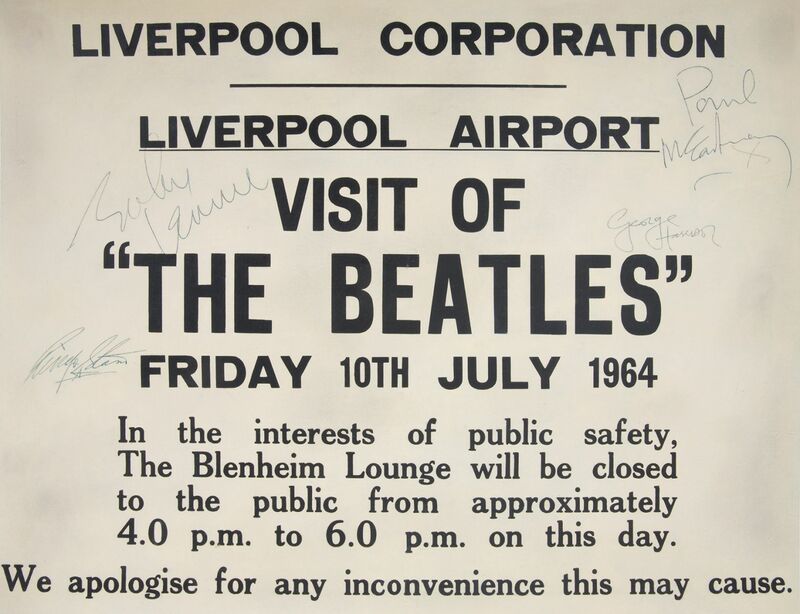 Darren Julien, President/Chief Executive Officer of Julien’s Auctions, said: "Julien’s Auctions is honored to have been a part of Beatlemania history with our record-breaking sales of some of the Fab Four’s most important and newly discovered memorabilia to come to auction. Each year we look forward to setting the bar even higher by putting together another spectacular auction event that celebrates the brilliance and artistry of rock and roll’s greatest and most iconic band." A selection of items will be on display during the week of the auction in The Beatles Story’s Fab4 Cafe on the Royal Albert Dock. The exhibition will run from Monday, May 6th until Friday, May 10th and is FREE to attend. Please note the attraction will be closed to the public on May, 9th, the day of the auction. To find out more about the auction, to bid and to track live progress, please visit: juliensauctions.com.